There are days when you want a sensory overload, but most of the time—in a world with an attention span of 3 seconds—you simply don't. You want to dial it down to the basics where things are easier, simpler yet 100% efficient. And nowhere is this desire more tangibly realised than while building and designing your home. The house we are exploring today has been designed keeping in mind the pared-down aesthetics of the couple who own it. Don't for a second think that that means living a monastic life! On the contrary, the house incorporates the needs of the owners, even providing each partner a separate zone to pursue their passions while keeping the space open enough in order to not appear foreboding. 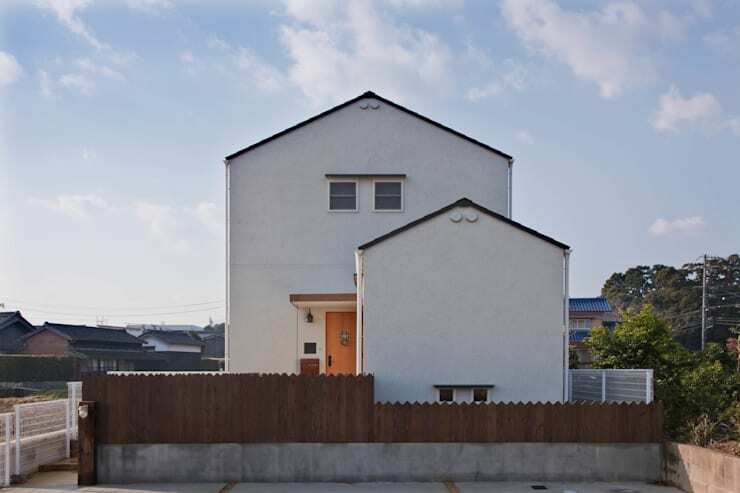 Here you see the house from the front—the white facade and slight gabled roof giving it a modernised traditional look. Notice how the house is built higher than the others in the neighbourhood; this was a conscious choice by the owners who wanted to have an unobstructed view of the surroundings. An unassuming yet efficient wooden fence (with a concrete base) protects the ground floor windows from prying eyes. At the same time, it also provides a certain rustic charm to the whole facade. 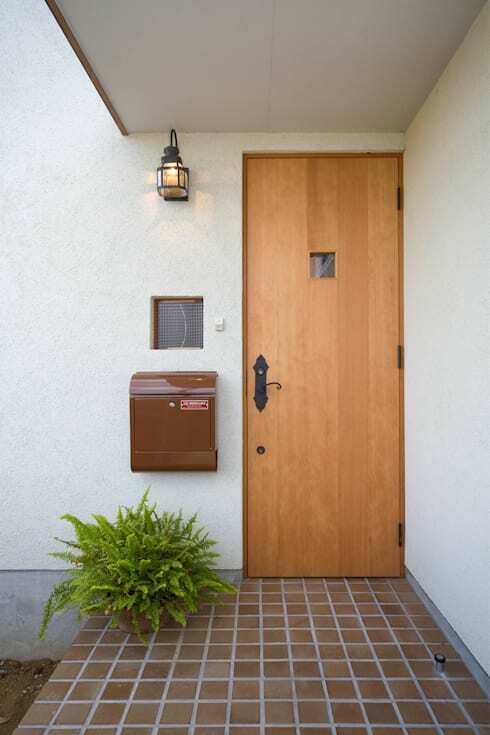 The entrance is kept as unassuming and simple as the overall facade. Yet, the rustic charm is undeniable. Small details such as the lush potted plant and the vintage-looking lamp go a long way into making this space appear welcoming. 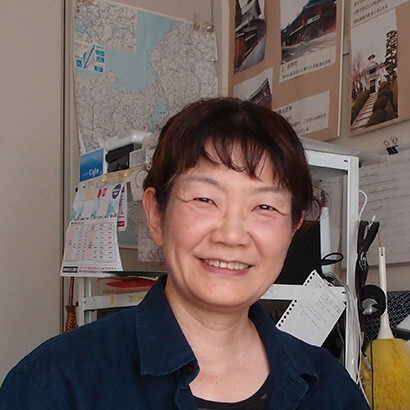 Like most Japanese households, there is a demarcated space that separates the outside from the interior. Here, that role is taken up by the lovely brown tiles that is a nice throwback to the 80s era ceramic tiles. If this caught your fancy, speak to our experts who can help you replicate this in your household. This here is the dining area of the house, with a view to the well-concealed kitchen. A combination of large windows and warm wood immediately infuses the place with warmth and coziness even though there isn't a shred of furniture here! Cedar and cypress wood have been used as the structural components while the flooring is made out of pine wood. Little nooks, be it on the wall or on the tile space breaks the monotony while directing the eye toward interesting visual elements. Here you can see the full extent of the minimalistic tastes of the owners. There are no unnecessary flourishes but as a whole, it completely works. The retro tiles we saw outside earlier make an appearance again; here, it offsets the pure white foundation as well as the sleek tiles. The top half of the working counter has been entirely done up in stainless steel, a low-cost yet functional option. 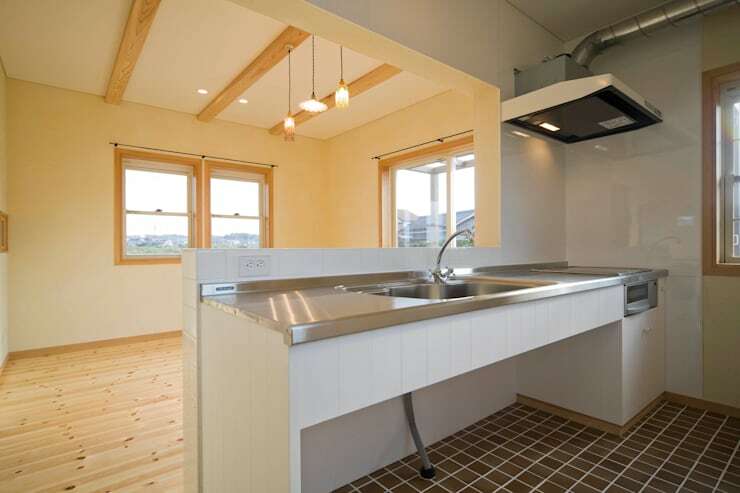 An open kitchen like this also makes it easier for the family to commune. Remember how we mentioned earlier about each partner getting a separate zone to pursue their passions? Here's one: originally envisioned as a study room, this space will now be sewing room for the lady of the house who considers it as a hobby. 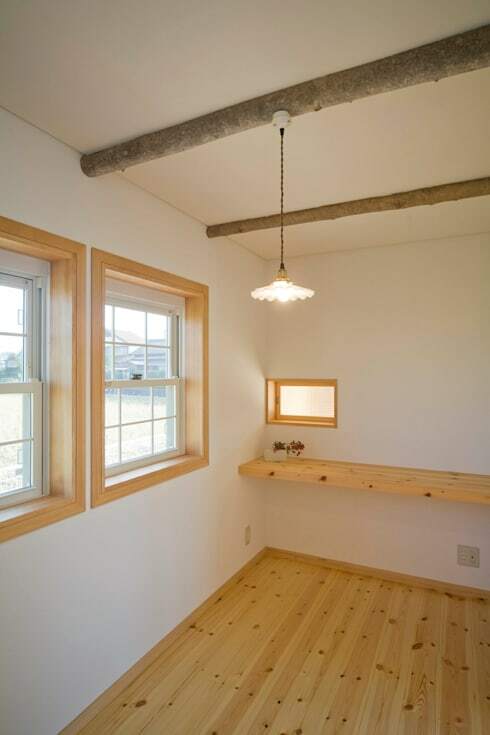 Once again, wood takes predominance here; there's even two log beams on which a hanging lamp is attached! The small opening on the right side is basically where mom can check up on the kids while she's working. 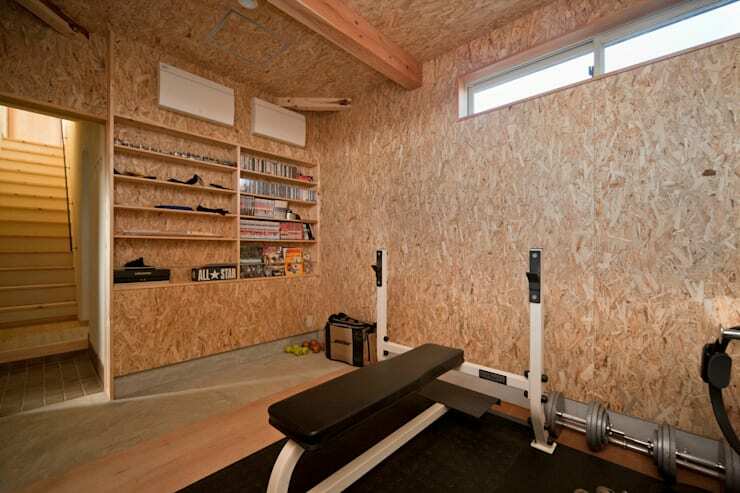 Situated near the entrance is the training area/gym for the father of the family. Gyms have a sordid reputation of being overly lit while looking rather sterile—a situation that makes you want to leave as soon as you get there. Not the case here. Warm wooden floors and a textured wall create the impression of the outdoors, an important factor for the dad. 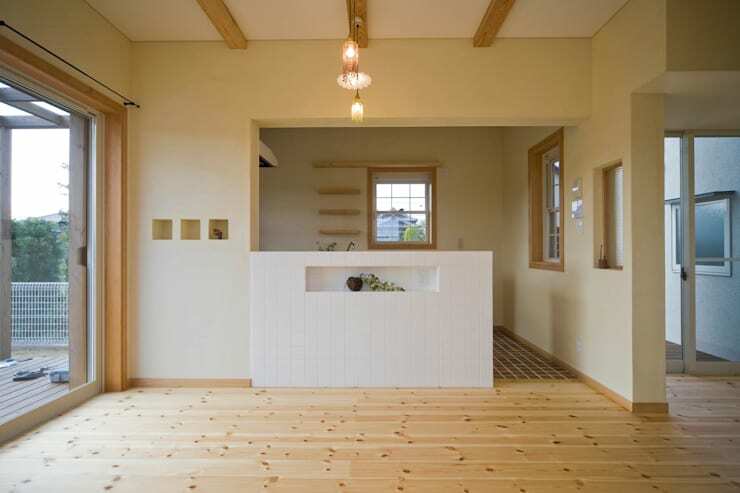 For more simple home inspiration, check out 8 Japanese homes you have to see. What did you think of this simple family home?